Please reference us when you use our bibliography in any publication weather online or in print. Please contact us if you would like to add a publication to this list. Stewart, J. A. 1912. “The Burmese Drama.” Journal of the Burma Research Society 2 (1): 30–37. Maung Tha Kin. 1914. “The cant of the musicians of Burma.” Journal of the Burma Research Society 14 (1): 51–52. Sachs, Curt. 1917. Die Musikinstrumente Birmas und Assams im K. Ethnographischen Museum zu München: Akademie der Wissenschaften. E. Maung. 1918. “Burmese Drama.” Journal of the Burma Research Society 8 (1): 33–38. Gyi, J. A. M. 1920. “At the play in Burma.” Blackwood’s Magazine 171: 562–71. Maung Htin Aung. 1938. Burmese Drama: A Study with Translations, of Burmese Plays: Geoffrey Cumberlege, Oxford University Press. Maung Htin Aung. 1939. “Tragedy and the Burmese Drama.” Journal of the Burma Research Society 29 (2): 157–65. Maung Kwey Bo. 1939. Burmese Nursery Songs: For Maung Khawy. Rangoon: Shumawa Company. U Khin Zaw. 1940. “Burmese Music: A Preliminary Inquiry.” Journal of the Burma Research Society 33. “Recordings of Burmese Classical Music.” 1941. Journal of the Burma Research Society 31 (2). U Aung Gyi. 1941. “Recordings of Burmese Classical Music.” Journal of the Burma Research Society 31 (2): 137–43. U Pok Ni. 1952. Konmara Pya Zat: An example of popular Burmese drama in the XIX century. London: Luzac. U Khin Zaw. 1958. “Burmese Music: A Partnership in Melodic Sounds.” The Atlantic February Issue (February Issue). Okell, John. 1964. “Learning Music from a Burmese Master.” Man 64: 183. Sein, Kenneth, and Joseph A. W. Sein. 1965. The Great Po Sein: A Chroncile of the Burmese Theater. Bloomington: Indiana University Press. Ba Han. 1966. “The Evolution of Burmese Dramatic Performances and Festival Occasions.” Journal of the Burma Research Society 49 (1). Becker, Judith. 1967. “The Migration of the Arched Harp from India to Burma.” The Galpin Society Journal 20:17–23. Becker, Judith. 1969. “The Anatomy of a Mode.” Ethnomusicology 13 (2): 267–79. doi:10.2307/850149. Maung Myint Thein. 1970. Burmese Folk-Songs: Collected and Translated by Maung Myint Thein. With the assistance of Maung Htin Aung. Oxford: Oxonian Press Limited. Okell, Johk. 1971. “The Burmese Double-Reed “Nhai”.” Asian Music 2 (1): 25. Garfias, Robert. 1975. 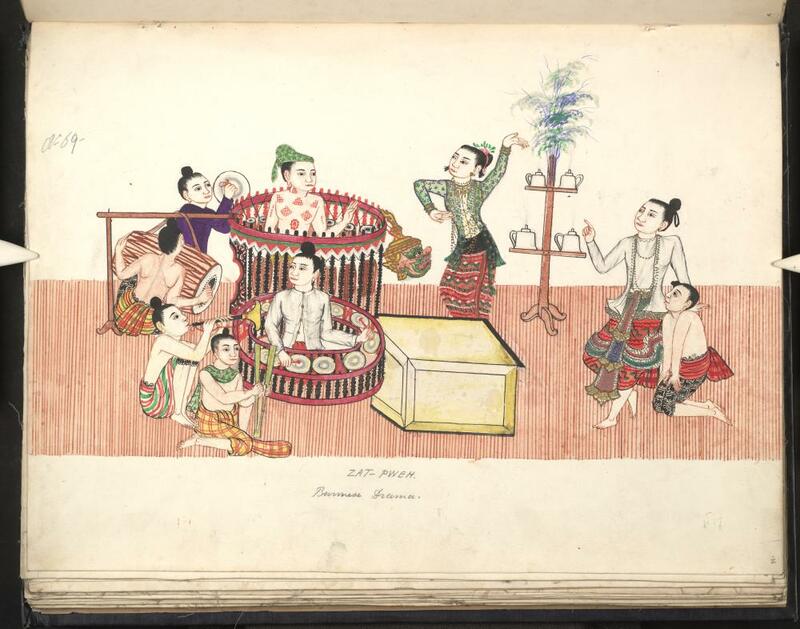 “A Musical Visit to Burma.” the world of music 17 (1): 3–13. Hla Pe. 1977. “Mind-bending Burmese Poems and Songs.” Journal of the Burma Research Society 59 (1): 1–46. Garfias, Robert. 1981. “Speech and Melodic Contour Interdependence in Burmese Music.” College Music Symposium 21 (1): 33–39. Garfias, Robert. 1985. “The Development of the Modern Burmese Hsaing Ensemble.” Asian Music 16 (1): 1–28. doi:10.2307/834011. Cox, Sherry. 1985. “A Burmese classical song: Text-Music Relationships in the Yodaya Song.” M.A., University of Hawaii. Singer, Noel F. 1995. Burmese dance and theatre. Images of Asia. Kuala Lampur [Malaysia], New York: Oxford University Press. Douglas, Gavin. 2001. “State patronage of Burmese traditional music.” PhD, Ethnomusicology, University of Washington. Foley, Kathy. 2001. “Burmese Marionettes: Yokthe Thay in Transition.” Asian Theatre Journal 18 (1): 69–80. Douglas, Gavin. 2003. “The Sokayeti Performing Arts Competition of Burma/Myanmar: Performing the Nation.” the world of music 45 (1): 35–54. Greene, Paul D. 2004. “The Dhamma as Sonic Praxis: Paritta Chant in Burmese Theravāda Buddhism.” Asian Music 35 (2): 43–78. Douglas, Gavin. 2005. “Burmese Music and the World Market.” Anthropology Today 21 (6): 5–9. Douglas, Gavin. 2007. “Myanmar’s Nation-Building Cultural Policy: Traditional Music and Political Legitimacy.” aito Art and Christian Conver Authenticity and Cultural Identity Senri Ethnological Reports 65: 27–41. Keeler, Ward. 2008. “Music Cultures and Regions: Burma.” In The Garland Handbook of Southeast Asian Music, edited by Terry E. Miller and Sean Williams, 363–400. New York: Routledge. Lu, Hsin-chun T. 2008. “Festivalizing Thingyan, Negotiating Ethnicity: Burmese Chinese Migrants in Taiwan.” Journal of Burma Studies 12 (1): 29–62. doi:10.1353/jbs.2008.0001. Diamond, Catherine. 2009. “A Delicate Balance: Negotiating Isolation and Globalization in the Burmese Performing Arts.” TDR (1988-) 53 (1): 93–128. MacLachlan, Heather. 2009. “Revealing the Heart: The Popular Music Industry in Yangon, Burma.” PhD thesis, Cornell University. Douglas, Gavin. 2009. “Mahagitá Harp and Vocal Music of Burma, and Nai Htaw Paing Ensemble: Mon Music of Burma, and: Princess Nicotine: Folk and Pop Music of Myanmar (Burma) (review).” Journal of American Folklore 123 (487): 113–16. doi:10.1353/jaf.0.0115. ေမာင္သန္းေဆြ (ထား၀ယ္). 2009. မဟာဂီတ ေျခရာေကာက္. Lu, Hsin-chun Tasaw 2009. “THE BURMESE CLASSICAL MUSIC TRADITION: AN INTRODUCTION.” Fontes Artis Musicae 56 (3): 254–71. Keeler, Ward. 2009. “What’s Burmese about Burmese Rap? Why Some Expressive Forms Go Global.” American Ethnologist 36 (1): 2–19. doi:10.1111/j.1548-1425.2008.01106.x. ေရနံသာ မဟာဂီတ. 2011. ျမန္မာတူရိယာ မဟာဂီတ. Yangon. Jirattikorn, Amporn. 2010. “Shan noises, Burmese sound: crafting selves through pop music.” South East Asia Research 18 (1): 161–89. MacLachlan, Heather. 2011. Burma’s Pop Music Industry: Creators, Distributors, Censors. Rochester, NY: University of Rochester Press. Lu, Hsin-chun Tasaw. 2011. “Performativity of Difference: Mapping Public Soundscapes and Performing Nostalgia among Burmese Chinese in Central Rangoon.” Asian Music 42 (2): 19–55. doi:10.1353/amu.2011.0017. Jane M Ferguson. 2012. “Sublime Rock: Burmese Popular Music, Language Code Switching and Sentimentalism among Shan Migrants at The Thai-Burma Border.” Wacana Seni Journal of Arts Discourse 11: 19–37. သိန္းေဖျမင့္ေ. 2012. ဦးဖိုးစိန္ – U Po Sein. Ferguson, Jane M. 2013. “Burmese Super Trouper: How Burmese Poets and Musicians Turn Global Popular Music into Copy Thachin.” The Asia Pacific Journal of Anthropology 14 (3): 221–39. doi:10.1080/14442213.2013.787449. Chiarofonte, Lorenzo. 2013. “Nat Hsaing. Repertori, Occasioni e Contesti Delle Musiche Nei Culti Di Possessione in Birmania”. Tesi di Laurea Magistrale, Sapienza University di Roma. Inoue, Sayuri. 2014. “Written and Oral Transmission of Burmese Classical Songs.” The Journal of Sophia Asian Studies (32): 41–55. Ye Dway. 2014. Myanmar Dance and Drama. Yangon: Today Publishing House. Lu, Hsin-chun T. 2014. “Recounting, Resistance, and Reflection: An Analysis of a Burmese Classical Musician’s Narrative.” In Burmese Lives: Ordinary Life Stories Under the Burmese Regime, edited by Wen-Chin Chang, Eric Tagliacozzo, and Mandy Sadan. Oxford, New York: Oxford University Press. ေဒါက္တာမင္းလဲ့ရ (Dr. Min Le Yi). 2014. ျမန္မာ့ရိုးရာေတးသီခ်င္းမ်ားႏွင့္ဗက်းလက္ယဥ္ေက်းမွူ: (Myanmar Traditional Songs and Folk Culture). Yangon: သင္းစာေပ. [in Myanma]Selth, Andrew. 2015. “Orientalism, “Burma girls” and Western Music.” Southeast Asia Research Centre Working Paper Series (165). Lu, Hsin-chun Tasaw. 2015. “Cultural homogeneity, embodied empathy: Incorporating musical pasts among Burmese Chinese peoples worldwide.” Ethnomusicology Forum 25 (1): 14–34. doi:10.1080/17411912.2016.1151811. ေမွာ္ဘီဆရာသိန္း. 2015. ျမန္မာဇာတ္ပြဲသဘင္ႏွင့္ ျမန္မာျပဇာတ္စာအုပ္မ်ား. Yangon. Selth, Andrew. 2016. Burma, Kipling and western music: The riff from Mandalay. Routledge research in music 14. New York, London: Routledge. Ferguson, Jane M. 2016. “I Was Cool When My Country Wasn’t: “Mao” and “Deng” Making Transnational Music in the Golden Triangle.” Asian Music 47 (2): 114–37. doi:10.1353/amu.2016.0018. Ferguson, Jane M. 2016. “Yesterday Once More: Tracking (un)Popular Music in Contemporary Myanmar.” Journal of Burma Studies 20 (2): 229–57. doi:10.1353/jbs.2016.0008. Diamond, Catherine. 2017. “Drenched in Victory, Facing Drought: Staging Transitions in Myanmar’s Performing Arts.” Asian Theatre Journal 34 (2): 347–71. https://muse.jhu.edu/article/667574/pdf.